Guest post by Stephanie Klose, a Brooklyn-based writer and editor, a contributor to Serious Eats New York, a blogger at stephanieklose.com, and apparently someone who feels a tremendous amount of upstate pride. When you prune an apple tree, you need to cut the branches back far enough that you can swing a dead cat through them. That is a piece of advice I got in 1993 or so, from an old man in Castleton-on-Hudson, NY. I was 16. He was drinking at the bar of the restaurant where a guy friend I very, very much wanted to be my boyfriend worked and we struck up a conversation while I was waiting. I learned a lot about his time in the army and the dogs he used to breed and whatever assorted useful facts he saw fit to share. Granted, his pruning guidelines inspired a lot more questions than they answered*, but that's not the point. The point is that I grew up in the kind of place where that was the sort of thing a drunk, lonely old man would think a 16-year-old girl would need to know: rural eastern New York State. There were orchards everywhere. We ate apples off trees in our backyard. A friend's family had a cider mill and when they weren't busy, you could bring your own apples over to press. They sold some at a roadside stand and kept some for themselves and the kids always managed to sock away a few bottles to ferment, which we would drink with great ceremony and giggling sometime over the winter. I still think a gently rolling hill covered with apple trees is one of the prettiest things I can think of, any season of the year, and I still like booze that's made from apples. 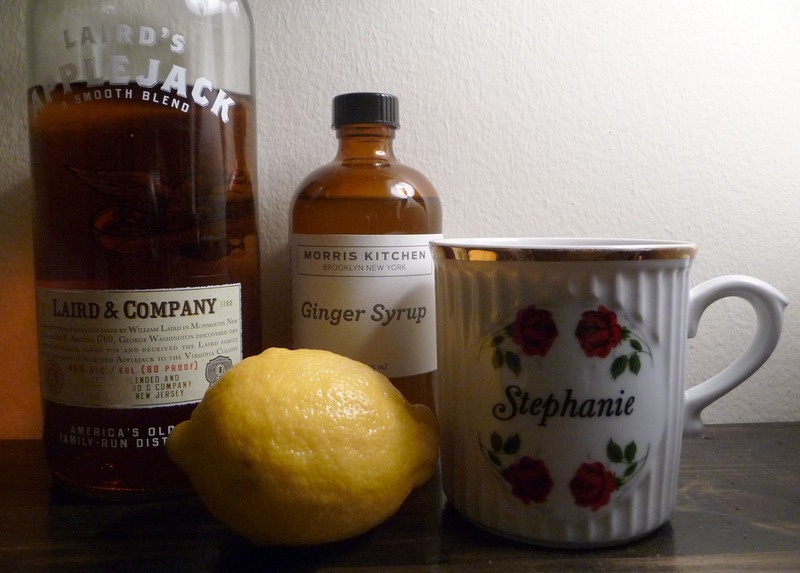 I happened to have a bottle of Morris Kitchen ginger syrup, but you can always make your own by mixing up some simple syrup and steeping ginger in it. Laird's applejack, which is what I had on hand, is perfectly good, but it's made in Virginia. Nothing against Virginia, some of my best friends have lived there and then moved away, but I'm partial to Cornelius, which is both very delicious and made in a town where I've eaten pizza a lot of times from apples they grow on the same land where the distillery is located. I don't really measure for hot toddies. I just take a mug -- I'm using my favorite mug from when I was kid, since this all has me feeling strangely nostalgic -- and add a shot of applejack, about a tablespoon of ginger syrup and the juice of half a lemon. I'm told that other people like a lot less lemon, so start with a quarter if you must, you pansy. Top it off with boiling water and stir. *I did ask him why it had to be a dead cat and he said that a live one wouldn't let you do it, which: fair enough.